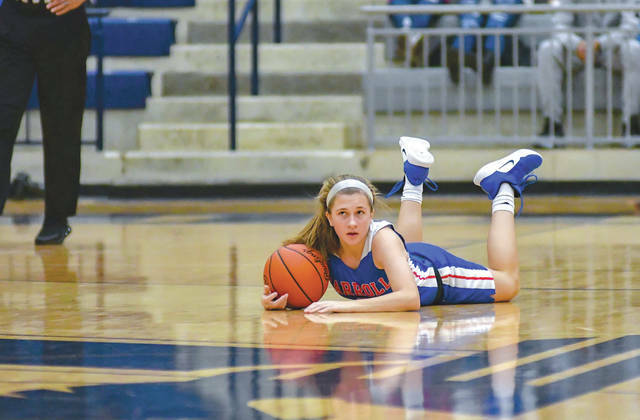 Carroll freshman guard Sarah Ochs falls on a loose ball in a Jan. 28 overtime win over Fairmont at Kettering’s Trent Arena. Senior Elisabeth Bush (21) drives around a pair of Fairmont Firebirds, Jan. 28, at Trent Arena in Kettering. Bush scored 14 points in the win. Carroll junior Julia Keller looks to put up a shot. 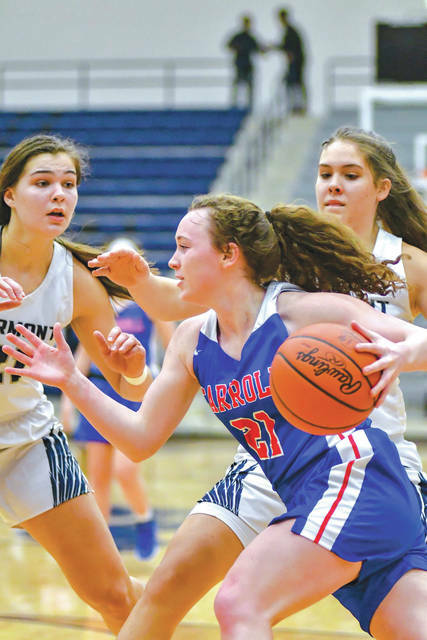 Keller led the Patriots with 17 points in a Jan. 28 64-60 overtime win in Kettering’s Trent Arena over host Fairmont. Junior guard Allie Stefanek battles for a rebound with a Fairmont player Jan. 28 in Kettering. 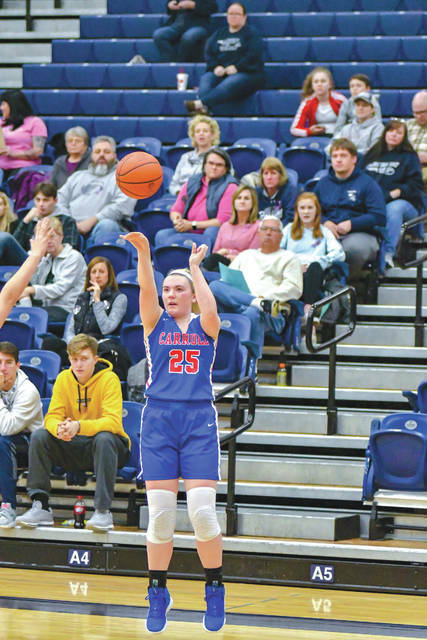 Stefanek scored a dozen points in Carroll’s overtime win at Trent Arena. 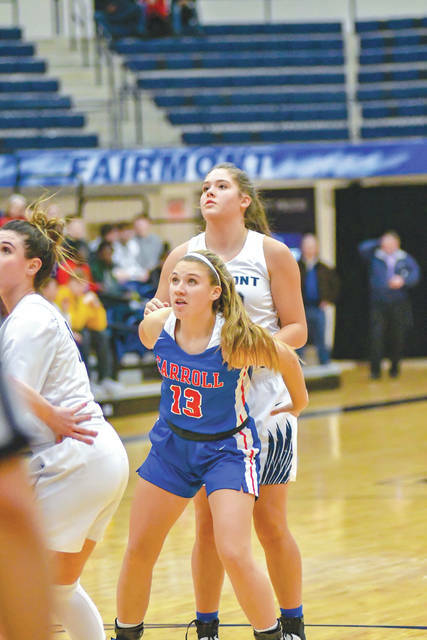 Carroll’s Jillian Roberts (13) boxes out during the Jan. 28 girls high school basketball game at Trent Arena in Kettering. 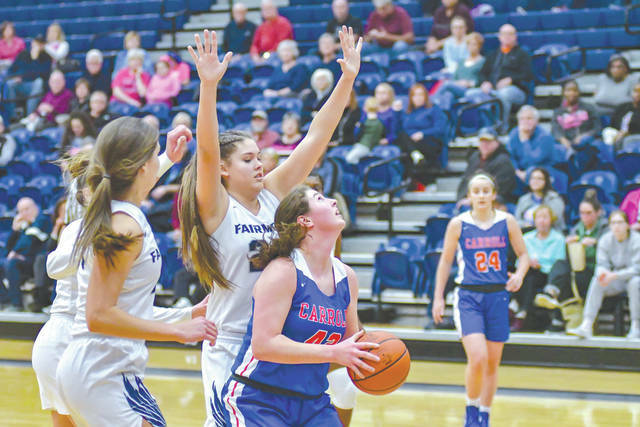 Patriots sophomore forward Megan Leraas fires from behind the three-point arc during an overtime road win Jan. 28 against Kettering Fairmont. KETTERING — Five days after losing their first game of the season to neighborhood rival Beavercreek, the Carroll Patriots — currently ranked No. 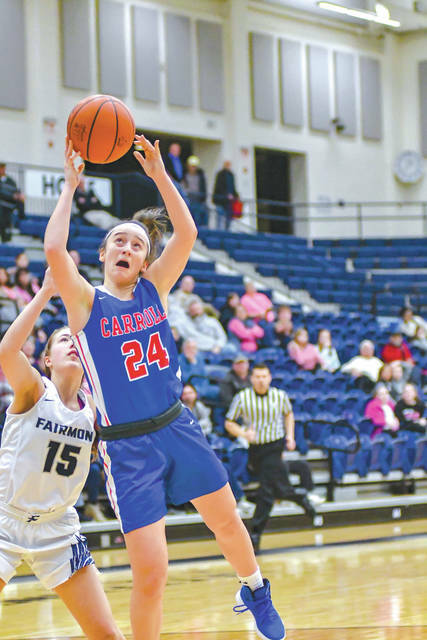 2 among Ohio’s Division II girls high school basketball teams — took on another Division I basketball power in Fairmont on Jan. 28. Carroll escaped with an exciting 64-60 overtime victory in Trent Arena.